This would have been a really fun bento to video tape too, so I’m extra bummed. I used another one of the Piece Talk cutouts from the Scrapbooks, Etc. magazine section I talked about when I did the Spring Chick bento, this time doing their cute sheep. The box is a new one that I bought specifically so that I could launch a contest around it, too, so keep reading for details on that! 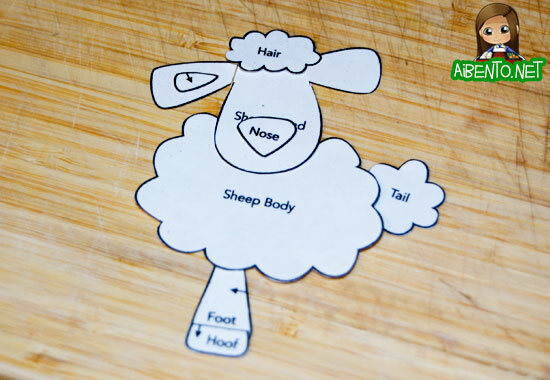 I started off by cutting out the pieces of the sheep from paper. The pieces with arrows were meant to be cut twice, so I folded nori over for the hoof and inner ear before cutting those. I also cut out the nose from nori. The fish sausage I was going to use for the sheep’s head wasn’t wide enough to accommodate the ears, so I cut them off to cut separately. I laid the white pieces onto a piece of cheese and began to cut. Since slices like these are so crumbly, I had to change toothpicks a couple of times and spin the toothpick to ensure a smooth cut. Even then, I had to cut the hair out twice and smooth over the edges with my finger after. Here’s a closer look at the sheep. I cut the pink parts out of the fish sausage the exact same way as the cheese. Since it’s very soft, it was actually easier to do than the cheese. I put it all together and then added the nori. I punched out the eyes and mouth. To make the flowers, I used a small flower cutter and a straw to cut the centers, swapping out cheese for fish sausage. The rice is dyed yellow with some deco furi, but you could use curry powder instead. On the other side of the baran is some leftover pork tofu topped with a tiny sprig of parsley. In the other tier, I have some strawberry halves, half a clementine, and some mochi eggs. I’d bought this cute green, pink, and white striped mochi for Girl’s Day last week and never ate it. Today I cut a slice off the top and then cut out some oval shapes with a food cutter to make some cute little mochi eggs. They came out awesome!! 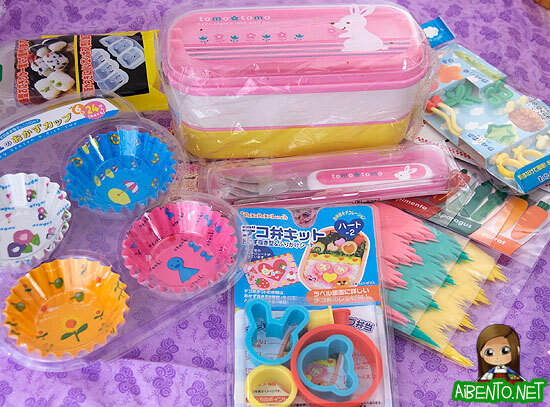 For my Spring Bento Contest, I’m offering up the same bento box (don’t worry, the prize contains an unopened one) along with a bunch of other accessories to go with it. To enter for this prize, all you need to do is comment on this blog post with what you think would make the perfect Spring themed bento to go into this box. I’ll accept comments until Sunday, March 14 and then randomly draw a winner from the entries. You may only enter once and you must provide a valid email that you check often. Who knows, maybe I’ll even make your suggestion!